Cities Turn Sewage Into 'Black Gold' For Local Farms : The Salt Cities are finding beneficial and lucrative ways to dispose of solid waste, while also helping farmers. But a lot of sewage still ends up in landfills or being processed at big, industrial incinerators. Thick jets of processed sewage arc out 30 to 40 feet from giant moving spreaders at Birmingham Farm in Kansas City, Mo. On a normal day, Kansas City, Mo., processes more than 70 million gallons of raw sewage. This sewage used to be a nuisance, but Kansas City, and a lot of municipalities around the country, are now turning it into a resource for city farmers hard up for fertilizer. After the sewage has been processed at a treatment plant, it's piped out to Birmingham Farm on the north side of the Missouri River. Tim Walters is the chief agronomist for Kansas City who runs Birmingham. 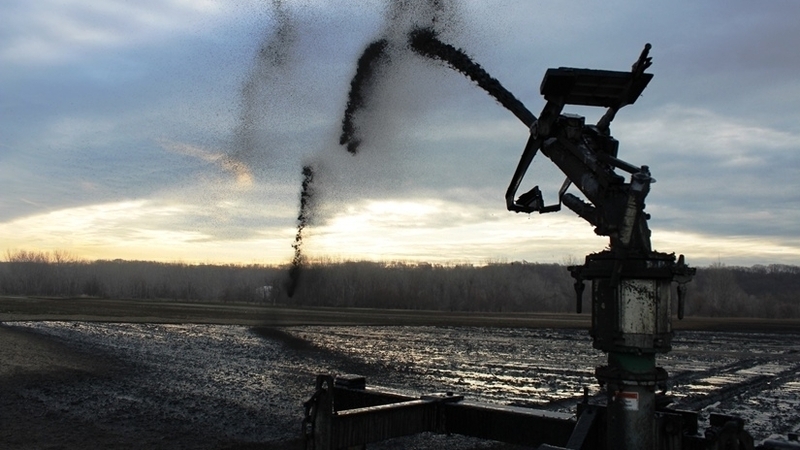 He's got the 1,350-acre farm plumbed with pipes to disperse the smelly stuff. "It's black, black gold," says Walters. "Looks like grease. Doesn't smell like grease ... and when you get it on you it's hard to get off." The sludge is packed with nutrients good for the corn and soybeans grown here that generate almost half a million dollars in profits for the city each year. Walters figures the free fertilizer is worth about $175,000 a year, in last year's prices. But it's in short supply. "Every year we typically run out, they can't digest enough, they can't get enough down to us," says Walters. The city's two digesters run all the time, but they still can't keep up with Birmingham's demand, let alone the city's supply of waste. Still, more than half the biosolids are put to use, which makes Kansas City just about average for the U.S., according to Ned Beecher, who directs the North East Biosolids and Residuals Association. Beecher says cities from Boston to Chicago to Los Angeles now sell or use most of their human waste. Much of it ends up as fertilizer for hay, corn, soybean, wheat or grape crops. But even with all the well-established, beneficial and even lucrative ways to dispose of solid waste, a lot of it still ends up in landfills or being processed at big, industrial incinerators. Shaun O'Kelley runs an incineration facility in Kansas City that burns human waste down to a fine ash, using lots of natural gas, electricity and manpower to do it. The incinerator no longer runs all the time, but O'Kelley is about to fire it up again because for now, burning some human waste is cheaper than recycling it. "Land application has its challenges," says O'Kelley. You need land, patience to deal with regulations and capital, he says. And, there's the smell; residents aren't always pleased to have an expanding biosolids-application program in their backyard. So, the drive to make good use of human waste has been largely stalled for years, and despite a steady stream of innovations, almost half of it is still wasted.